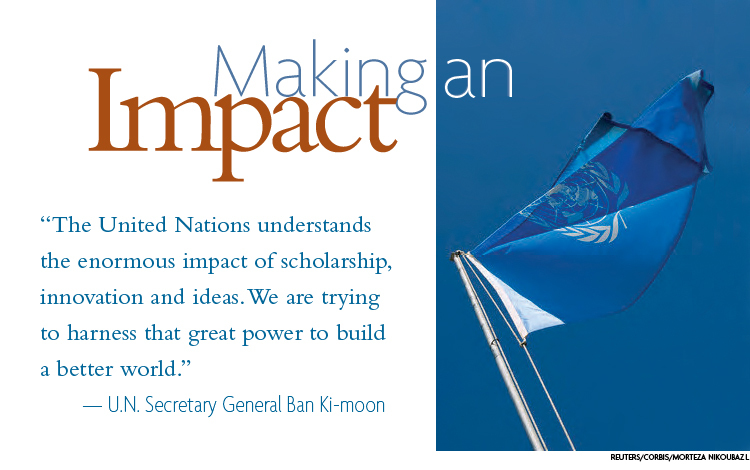 o spoke U.N. Secretary-General Ban Ki-moon at the official launch of the United Nations Academic Impact (UNAI). FDU is more than willing to do its part. The University was the first to join the alliance, and President J. Michael Adams spoke on behalf of the inaugural members at the opening ceremony November 18 at U.N. Headquarters. An initiative of the U.N. Department of Public Information, the UNAI unites educational institutions and the United Nations in an alliance designed to engage faculty and students in activities that further the goals and principles of the world body. More than 300 university presidents, senior faculty members and student representatives joined the U.N. secretary-general and other senior U.N. officials for the launch, which included a two-day conference and an inaugural concert featuring the Asia-Pacific United Orchestra. 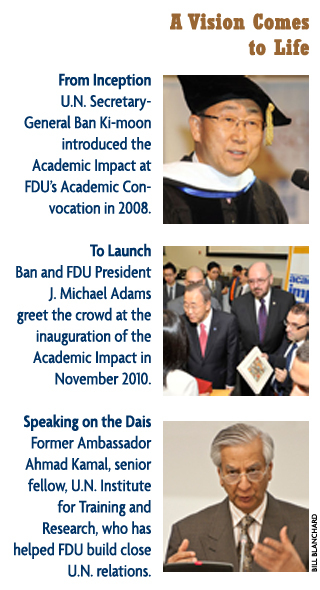 The Academic Impact (www.academicimpact.org) was first unveiled two years ago by Ban during his address at FDU’s 2008 Academic Convocation. The membership now includes more than 500 institutions from nearly 100 countries. Member institutions commit themselves to a set of 10 principles derived from the U.N. Charter, the Universal Declaration of Human Rights and the U.N. Millennium Development Goals. These include human rights, literacy, sustainability and conflict resolution. The institutions agree to participate in at least one activity or project every year — research projects, papers, conferences, classroom lessons, extracurricular activities, etc. — that supports and advances those principles or supports U.N.-related efforts. 1. A commitment to the principles inherent in the United Nations Charter as values that education seeks to promote and help fulfill. 2. A commitment to human rights, among them freedom of inquiry, opinion and speech. 3. A commitment to educational opportunity for all people regardless of gender, race, religion or ethnicity. 4. A commitment to the opportunity for every interested individual to acquire the skills and knowledge necessary for the pursuit of higher education. 5. A commitment to building capacity in higher-education systems across the world. 6. A commitment to encouraging global citizenship through education. 7. A commitment to advancing peace and conflict resolution through education. 8. A commitment to addressing issues of poverty through education. 9. A commitment to promoting sustainability through education. 10. A commitment to promoting intercultural dialogue and understanding, and the “unlearning” of intolerance, through education. 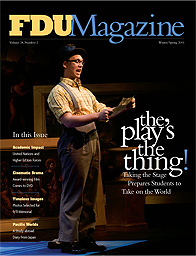 FDU Magazine welcomes your comments. Use the comments box above or e-mail Rebecca Maxon, editor, at maxon@fdu.edu.